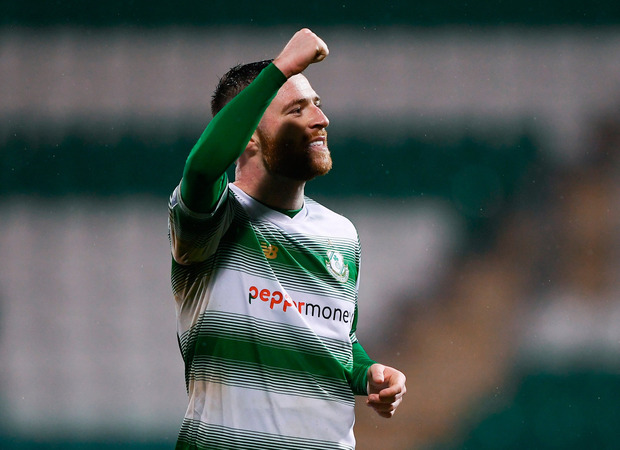 Jack Byrne has always backed himself, but the Shamrock Rovers midfielder admits that he expected to be somewhere else this week. The 22-year-old presumed that he would be preparing for a trip to Finn Park tomorrow, not boarding a flight to Gibraltar with Mick McCarthy's Irish senior squad. He's never given up hope of getting back to the international stage. Byrne was invited in to train two months ahead of Euro 2016 when he was flagged as the next big thing. Most observers would have anticipated that Byrne would have been back soon. They just wouldn't have envisaged Shamrock Rovers being in brackets beside his name. The one-time Manchester City starlet came home after a brief stay at Kilmarnock, a switch that never really ignited as he sought to move beyond a turbulent year at Oldham. This year was supposed to be about getting the show back on the road, but Mick McCarthy's trip to Tallaght to watch him star against Sligo Rovers last Friday has opened doors. "Never in a million years would I have thought it would have led to this," beamed the Dubliner ahead of another day on the training ground. "It's been a mad couple of days, a strange one. I was 19 the last time I was in here, and I've been through a lot in the game since then. "I was still learning back then and probably didn't know what the real football world was like. When you leave a big club... it is what it is." His confidence was the striking aspect of that cameo appearance and it was clear that Martin O'Neill wasn't entirely enamoured by it. It was put to Byrne that the Derryman and Roy Keane believed he was too brash. "It wasn't said to me," he replies. "He (Keane) didn't really speak to me. Either did Martin. I wasn't in the squad. I was only up there training. "I loved it, and it was an honour. You can't explain what it's like putting a 19-year-old in that position, and how they will react when there are cameras in front of you and the whole country wants to talk about you. It took me a while to get my head around it." Mistakes were made when it came to choosing clubs. He owned a house in Manchester and that influenced his decision in picking Blackburn, Wigan, and Oldham as destinations. At Rovers, he has found happiness. Living back in Dublin after being away since he was 14 has reintroduced him to home comforts. His mother is delighted. "I'm staying in me Ma's and getting spoiled," he grins, before moving on to his Rovers family. The manager (Stephen Bradley) has been unbelievable for me and so has (Stephen) McPhail and the rest of the staff. I wouldn't be here if it wasn't for Shamrock Rovers and us doing well. "There are some good players in the league, some good teams as well. People should get out and watch it a bit more and promote it a bit more." Byrne's return has played its part.